Web 2.0 marketing is a crucial topic in today’s marketing, even for businesses that usually operate offline. But since there are so many web 2.0 sites, and it’s just a small part of the bigger picture of your business, you might feel confused or overwhelmed. What you probably need is a simple step by step plan to implement web 2.0 marketing to your business. The ebook ‘Web 2.0 Marketing’ is just that: an easy to follow guide to build your presence in the world of social marketing and social networking. If you follow through with this simple step by step plan, you’ll achieve a presence in the web 2.0 sphere that very few of your competitors can match. 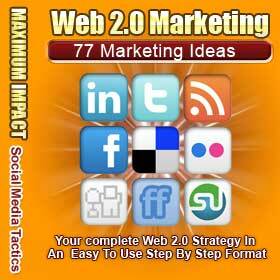 Download Web 2.0 Marketing Ebook.